The Blackmagic Studio Camera 4K, along with four Teranex Expresses and 24 Teranex Minis were recently used by Production Designer Robb Jibson of Chicago firm So Midwest, Inc., Video Director Jack Edinger and Upstaging Inc. to shoot the popular bands’ 42 city summer concert tour. For more information on their setup for the tour and their experience with the Studio Camera 4K, see the press release below. Fremont, CA – December 15, 2016 – Blackmagic Design today announced that Illinois production company Upstaging Inc. built a complete IMAG and AV production using the Blackmagic Studio Camera 4K and a large number of other Blackmagic Design products during this year’s sold out Weezer and Panic! At the Disco summer concert tour. Included in the workflow were four Teranex Expresses and 24 Teranex Minis used throughout each venue to convert various camera signals. American pop rock/punk band Panic! At the Disco toured this summer to promote their number one album, “Death of a Bachelor.” The band teamed up with alternative rock band Weezer, famous for songs like “Buddy Holly,” “Undone – The Sweater Song” and “Say It Ain’t So,” for a 42 city tour over the summer of 2016. 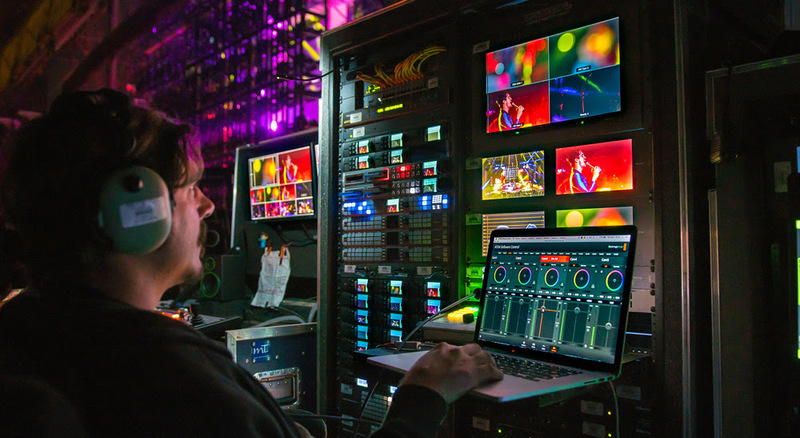 Production Designer Robb Jibson of Chicago firm So Midwest, Inc. and Video Director Jack Edinger chose a 4K Blackmagic Design setup for the tour’s video needs. Working with production company Upstaging Inc. on the tour, which provides services like stage lighting, IMAG and video systems, Robb and Jack developed a system that included four Blackmagic Studio Cameras 4K for IMAG, as well as engineering racks containing ATEM 2 M/E Production Studio 4K, ATEM 2 M/E Broadcast Panel, HyperDeck Studio Pros, Teranex Expresses, Teranex Minis, MultiView 4s, SmartView 4Ks, SmartScope Duos, ATEM Talkback Converters, UltraScopes and various Mini Converters. For the main IMAG needs, Jack and Robb used a Blackmagic Studio Camera 4K at the front of the house, as well as one on a tripod in the pit, one on a monopod in the pit and one on the right side of the stage. The cameras ran via fiber optic cable through a Camplex FIBERJ-P1 FiberJuice box for power and communication, which fed one line of fiber power back to the equipment they had on the engineering racks. The racks contained an ATEM 2 M/E Production Studio 4K which the team used to do the live cut of the show. During Weezer’s set, they also ran the program cut back into the ATEM 2 M/E Broadcast Panel to do SuperSource and customize the cut to play with the show’s LED wall. They used ATEM software on a laptop to load graphics for the show, for downstream keying and to shade some of the cameras. Also on the engineering racks were a Smart VideoHub 40×40, which was used to route video throughout the venue, and two HyperDeck Studio Pros. One HyperDeck Studio Pro recorded the program cut of the show while the other was routed via SDI cable so that instead of playing back the program cut it played music videos on the IMAG screens before the show started and in between acts throughout the night. There were also four Teranex Expresses and 24 Teranex Mini SDI Distribution with Smart Panels to convert camera signals for the various routes as the team needed. They also used several MultiView 4 units and SmartView 4K monitors to be able to see everything as it was happening, as well as two SmartScope Duo 4K monitors as combination scopes and monitors. Product photos of Blackmagic Studio Camera 4K, ATEM 2 M/E Production Studio 4K, ATEM 2 M/E Broadcast Panel, HyperDeck Studio Pro, Teranex Express, Teranex Mini, MultiView 4, SmartView 4K, SmartScope Duo, ATEM Talkback Converter, UltraScope, Mini Converters, and all other Blackmagic Design products are available at www.blackmagicdesign.com/press/images.